If you follow me on twitter or instagram you may have already spied my new purchase but I thought I would show it off some more as I am absolutely in love with it! I have forever loved Marc by Marc Jacobs but shamefully I have never actually purchased anything from them, it has always been a brand that I have admired from afar...that all changed when I purchased this beauty! 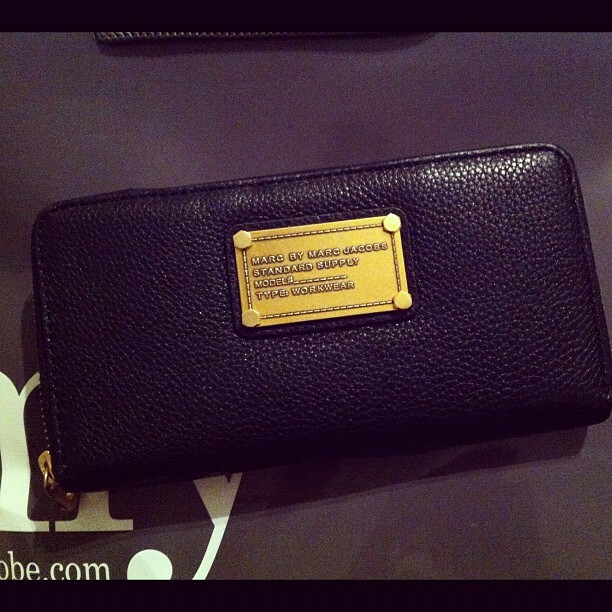 It is a Marc by Marc Jacobs black zippy purse bought directly from My Wardrobe. I cannot begin to tell you how many times I have picked up and stroked this purse in Harvey Nichols or added it to my basket on my wardobe and knew that one day it would be mine. I managed to snaffle a discount code and managed to bag this purse for just under £130 posted which I thought was a pretty good deal (as the RRP is £155). I always spend a little more on good quality purses as it is something that we probably use most often day in, day out and the style of this is so classic and won't date, a investment piece if I do say so my self! The black version is not on the website anymore but it is available in red! Do you spend a little more on designer labels or are you more a primark kinda girl? Would love to know your thoughts! I must admit i do love the finer things in life! Gorgeous purse Sinead! I'm in love with the rose gold Marc Jacobs watches and i'm definitely going to be treating myself with one ASAP maybe for my 21st. aww yay glad you finally got it :) nothing like a designer purse...you'll use it so often! I love the occasional designer buy- makes you feel so much better that you've worked for money than like 20 things from primark! Very pretty , I have my eyes on the bright orange version of this ! You won't be disappointed quality wise! I bought myself a Marc by Marc bag and it was the best purchase ever. Such good quality and so pretty! Absolutely gorgeous! We always need pay day treat every now and then, though mine seem to be every pay day! Ahhh it is so pretty! I would love to own a designer handbag but I don't have the patience to say. I only work one day a week, the rest is spent interning, so I have very little money. It would take me years to save! Hopefully I will have a proper job soon so I can splurge! It's gorgeous, it looks like such a classic piece too so you know you'll get a lot of use from it! I have this exact purse! Treat myself in Selfridges, unfortunately not with a cheeky discount! I'm very tempted to buy an expensive purse, all my purses break! I've only had my River Island purse less than a year and it's already falling apart! :( Sigh! This is such a gorgeous purse!